"The best book ever written by man or woman...deserves to sell more copies than the Bible." - Rebel, Inc. The only way such a blurb as this can possibly work is for potential readers to pick up the book in defiance, as in, "We'll see about that!" "The greatest piece of popular fiction ever produced." Lindelof doesn't steal the hyperbole crown from Rebel, Inc, but I did find myself once again declaring, "Oh yeah? We'll see about that!" 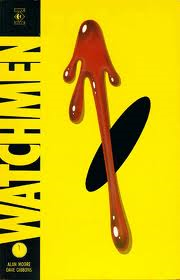 As I was struggling through Watchmen, I found myself defending my new love of graphic novels to a friend. This friend wasn't against graphic novels, just the opposite, but somehow he had gotten the impression that I turned up my nose at them. "Au contraire," I said (which turns out not to be the phrase you use to prove you are not a snob), and merely suggested that I was late to the game. "That could be your issue with Watchmen," he decided, "if you weren't into superhero comics as a kid, you probably wouldn't appreciate it as much." Finally some honesty here! This isn't a stand alone novel, this needs context, this needs more than a passing familiarity with Superman, Batman and all the other costumed heroes in order to be experienced fully. I found myself thinking of Nirvana's Nevermind album. I should note up front that I absolutely loved that album. I had it twice on cassette, when the 2nd wore out, I got it on CD, and now it's on my iPod. I still listen to it on occasion. However, and believe it or not, I never bought into their hype or the hype of alternative music that surrounded them. Wait one sec, Nirvana still played rock music did they not? Now polka, that's the real alternative. With the exception of killing hair metal, Nirvana didn't really change the music scene. What was the most popular song in the world just five years after Nevermind? "Wannabe" by the Spice Girls. As it turned out, people still wanted to have fun. But, in the wake of Nirvana you had to choose: good music or fun. Hi there, I just got back from my tangent. Somewhere along the way I meant to show how Watchmen was like Nevermind, but after such a long trip, I'm too lazy to connect my own dots right now. 3. Middle aged crisis- I get it, comic book fans had grown up. But good Lord, did they all need shrinks and Prozac? The psychological elements were simultaneously heavy handed and surface level. Too much, too little depth. A 200m wading pool of disillusionment. Have you had enough yet? Something nice, something nice... Oh, I've got one! The comic within the comic: Tales of the Black Freighter. In the alternate universe of Moore's, people are not interested in superhero comics, but are instead into pirate stories. One of these comics is being read by a boy in New York City and while it doesn't enter into the main plot at all, it does has some interesting parallels. Plus, I thought it was a nice reprieve from a novel I didn't really care for. So to Lindelof, TIME writers, and other fans: I'm sorry I didn't like your recommendation. Maybe you just want to enjoy it on your own time. I liked Nirvana, but let's face it, they weren't all that. "The best book ever written by man or woman...deserves to sell more copies than the Bible." - Rebel, Inc. That quote me ROTFLMAO (rolling on the floor laughing my a$$ off). Whenever I see a quote like that, I get suspicious. Are they just saying that to get me to buy it> etc. Teddy: Actually, that blurb was for Trainspotting and despite it, it was still a pretty good book. I did, however, read it aloud to understand the Scottish dialogue. Actually John, I don't think either book would be my cuppa java.